Yavani (Frt.) (Trachyspermum ammi (Linn.) Sprague ex Turril. English equivalents of Ayurvedic clinical conditions and diseases. 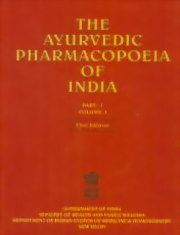 The Ayurvedic Pharmacopoeia of India is a legal document of standards for the quality of Ayurvedic drugs and substances included therein (under the Drugs and Cosmetic Act, 1940.) The first volume contains 80 monographs dealing with Pharmacognostical, chemical and Ayurvedic standards of the plant drugs used in Ayurveda.